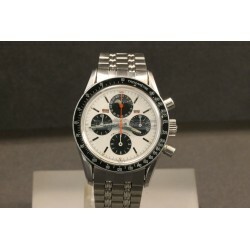 Search "Universal Geneve Tri-Compax" 4 results have been found. 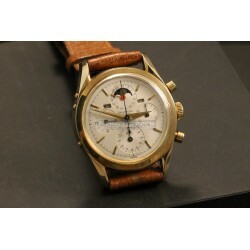 18kt yellow gold case ( diameter 37mm ) Hand winding movement caliber 481 Brown crocodile strap Wonderful original dial with 4 counters With chronograph With moon phases With day, date and month Plexi glass Reference 12296 Made in the '50s With its original guarantee not filled! Wonderful conditions! 18kt yellow gold case ( diameter 36mm ) Hand winding movement caliber 281 Brown leather strap Rare original dial customized for 'Gobbi Milano' With chronograph With complete calendar ( day, date and month ) Plexi glass Reference 522101-1 Made in the '50s Rare model Wonderful conditions! 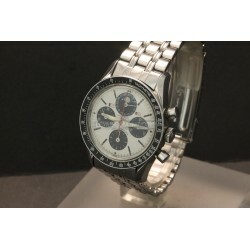 Steel case ( diameter 36mm ) Extremely rare original steel bracelet Hand winding movement caliber 281 Beautiful original dial With day,date and month With chronograph Plexi glass Reference 881101/01 Made in the '60s Wonderful conditions! 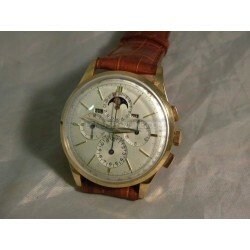 -Steel case ( diameter 36mm )-Steel original bracelet-Hand winding movement caliber 281-Beautiful original dial-With triple date calendar and moon phases-With chronograph-Plexi glass-Reference 881101/01-Made in the '60s-Rare model called by the collectors 'Evil Clapton'!-Wonderful conditions-With its rare original guarantee!